Two sisters addicted to crafting in all of it's forms. I wanted to make an outfit for Eloise. In my head this outfit was going to be a grey/white dress with a blue/grey jacket. Unfortunately I was not able to source any grey and white chevron fabric locally. 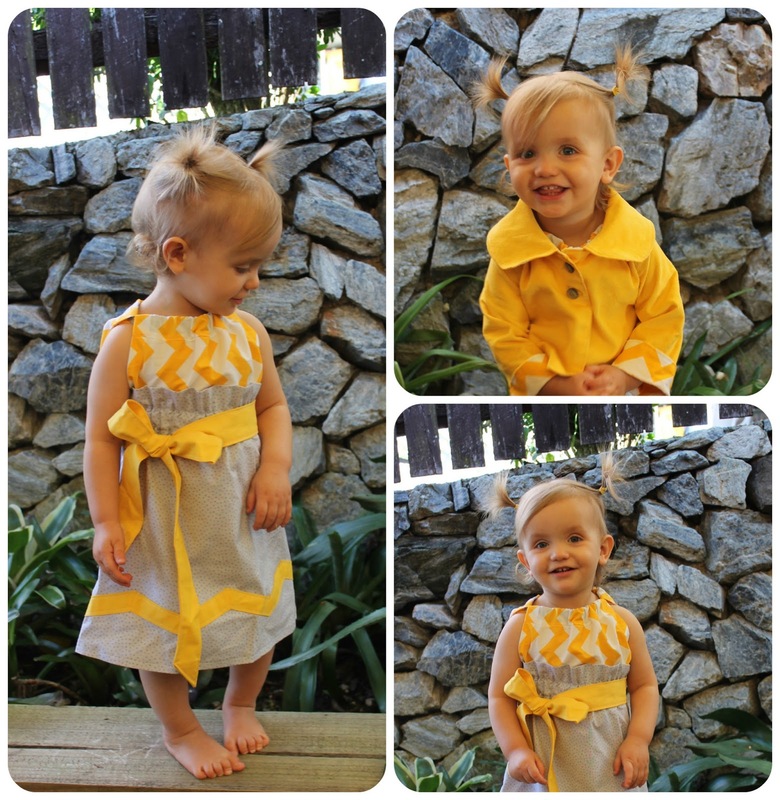 Then I came across this yellow corduroy and yellow chevron and decided to go with some bright warm yellows with grey instead. I chose the Molly Jacket pattern for the jacket, even though I'd not actually made it before (but I had seen others make it and it is sooo cute). I kept changing my mind on what style of dress/skirt I wanted to use. In the end I decided to use the Aurelia top and skirt as a base and modified the skirt with an appliqued chevron around the bottom. The Aurelia is two patterns in one (skirt and tunic). I didn't follow the instructions to the letter, I did things my way a bit, but the end result was the same. For the skirt, I made a chevron for the bottom by first making one inch wide bias strips and then ironing creases at 3.5" intervals. I then sewed at these crease marks to add the angles (alternating each one). 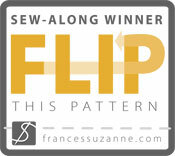 I pinned it in place then I top-stitched it along the top and bottom. I feel it tied in the yellow and added a bit of chevron-y fun to it. 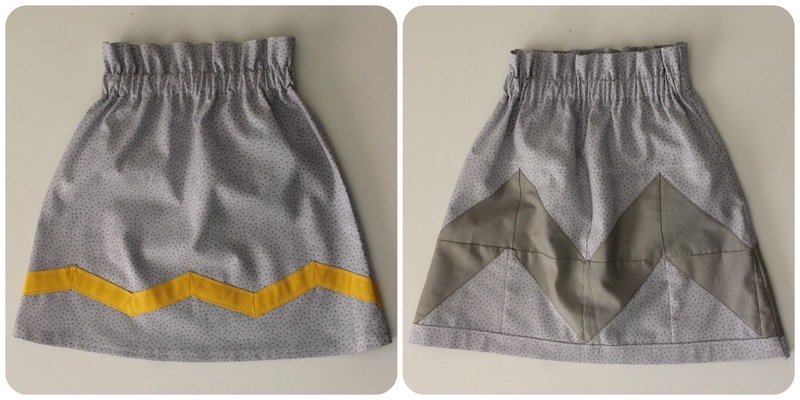 When it was finished I wasn't sure if I liked it so I made another skirt with a wide grey chevron (I made half square triangles and arranged them in chevrons). I then wondered if it was chevron overload and decided I liked the tunic with her jeans instead (and they're more practical for my busy toddler anyway). The tunic came together quite easily. The trickiest part was matching up those chevrons. Look, they line up!!! (well pretty closely anyway). The Molly jacket was quite an easy sew. The only thing I changed was the width of the sleeves. I didn't want them to have the gathered bottom and I didn't want them to flare out so I cut a bit off to make them straighter. I am really happy with the end shape. The great thing is this jacket is fully reversible!! 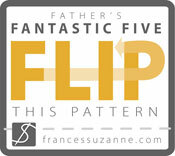 (I love reversible items - especially with my messy little miss). I'll definitely be making more of these. A little girl needs a different jacket for each outfit right? Then we decided it would be fun if we made some cute things for Griffin to wear too. 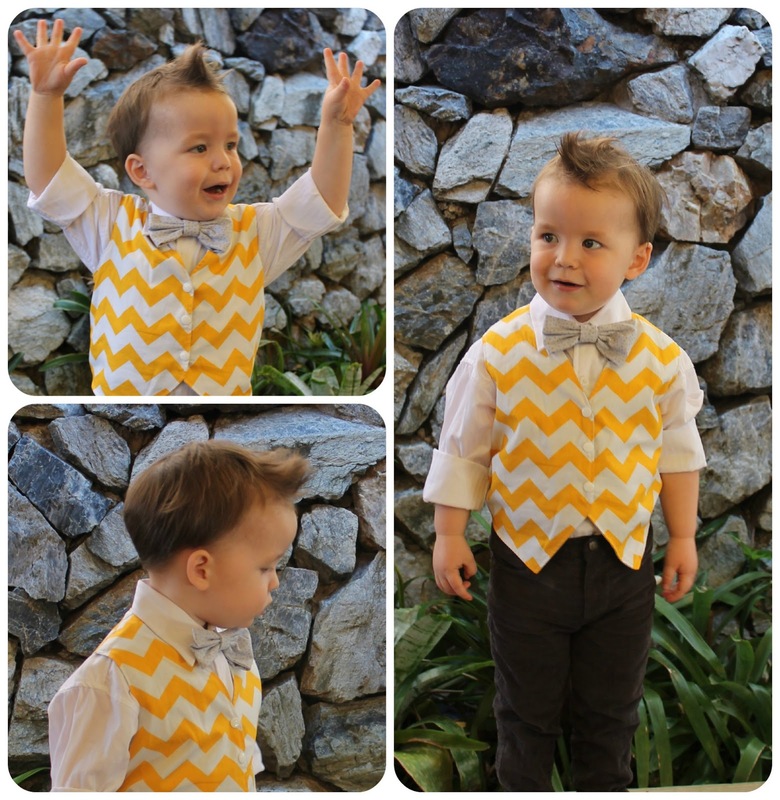 Linda made this little reversible vest with the chevron fabric and also an adorable little bow tie. And she made these cute little yellow clips for Ellie to wear in her hair. Oh, and this matching bunting. Remind me next time that taking photos of two littlies under two can be a tad challenging. They wanted to run and climb and chase seagulls. Lucky is was a perfect sunny winter's day (and not too cold). Seth was our cheeky assistant, I must make some things for him again soon so he can have the spotlight. Griffin and Eloise are 8.5 months apart but very close little cousins. They spend most days playing together. It's so cute to watch Griffin share his things (and food). He's so gentle and always thinking of Eloise. Eloise is a bit bossy and very outgoing. She's always interested in what Griffin is doing and follows him around to play with him, I think they are going to grow up as great friends. It's been fun thinking up chevron inspired ideas. 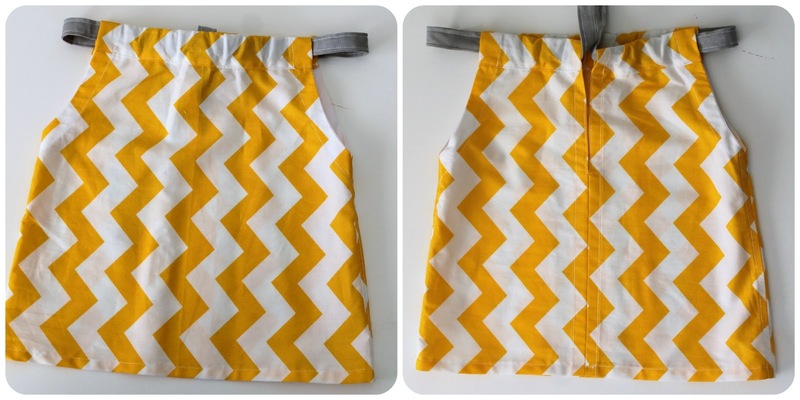 Please check out the rest of the great "inspired by chevrons" posts by Rebecca and her guests on Rock the Stitch!! Gorgeous creations - the colours are wonderful. She is growing up much too fast, but I'm loving watching her personality develop. She has only recently started to let us put her hair up, I think she looks pretty adorable (I might be biased). 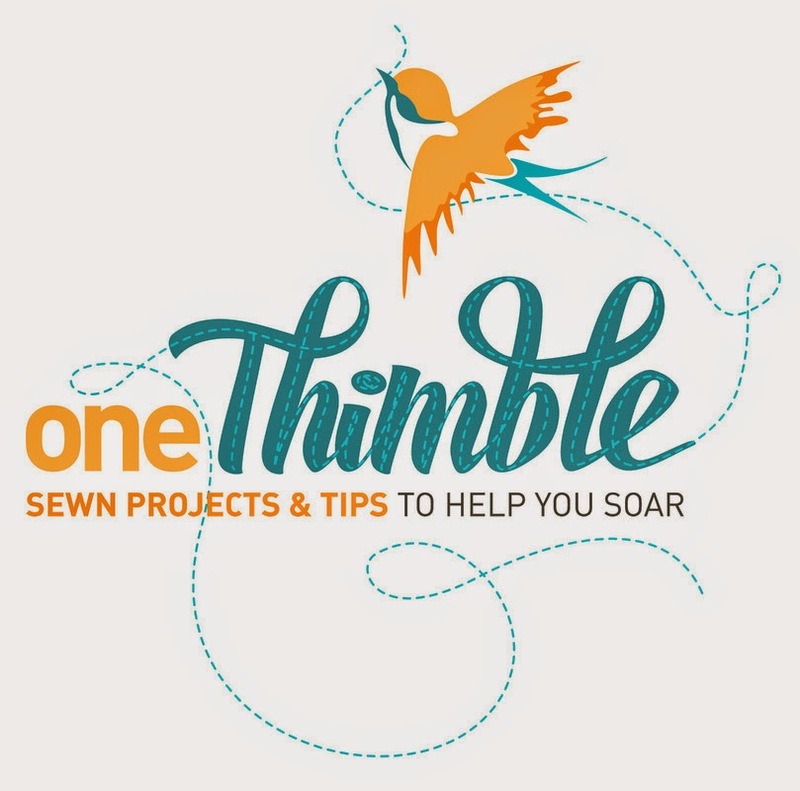 Click here to visit One Thimble.